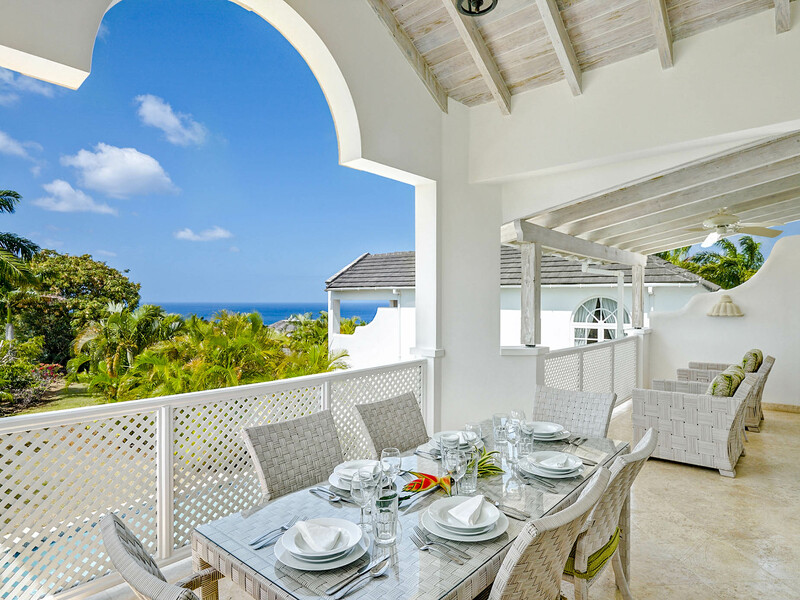 Villa Westmoreland is a modern three-storey holiday home right on the coast of Barbados. 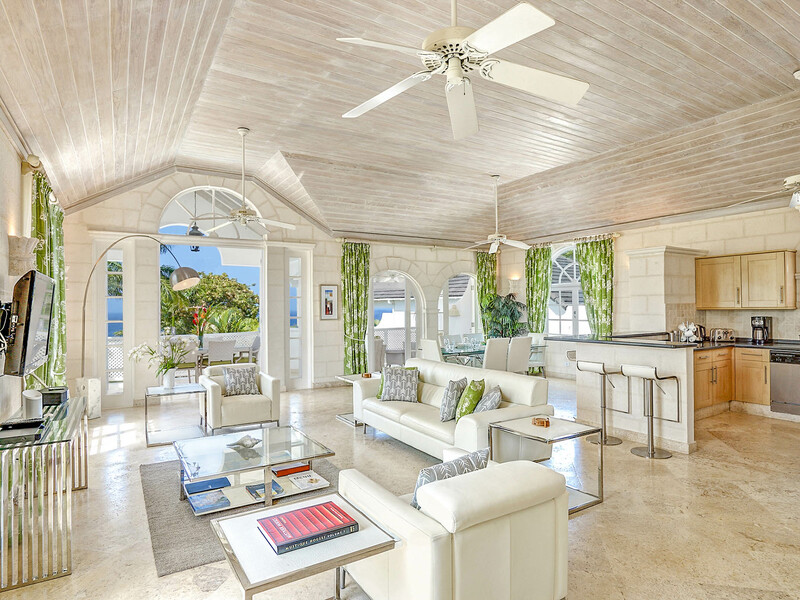 The detached home’s contemporary white exterior is beautifully decorated by plants and trees native to Barbados and perfectly overlooks the horizon. The open plan living and dining area boasts plush leather white sofas complemented by tropical green curtains and cushions. 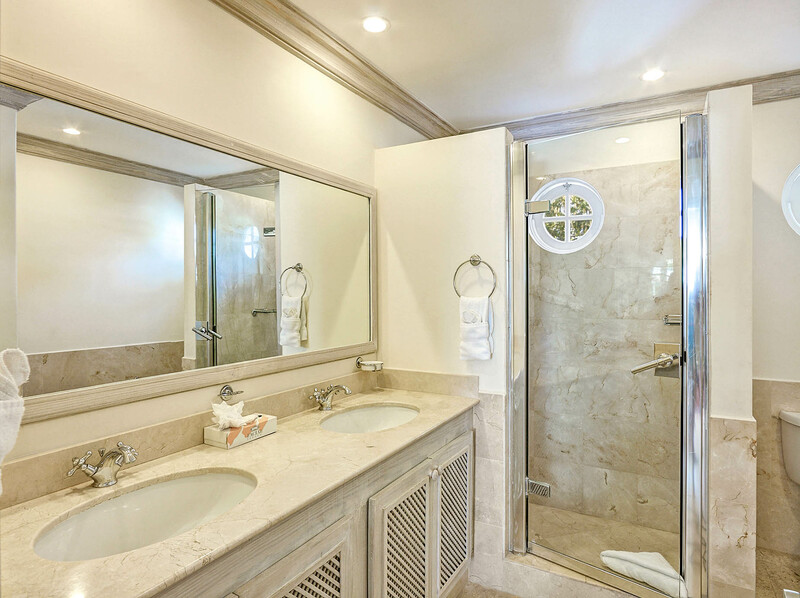 The entire living space has elegant marble floors and contains its own in-house entertainment including a flat screen television, stereo, DVD player and iPod docking station. This area is also connected to the kitchen which has bar stools in front of one of its counters, as well as a coffee maker, a blender and more essential appliances. The dining area consists of a chic glass table and white dining chairs for six people. Wide doors provide an entrance to the pool deck with sun lounges from the living area. Spacious and serene natural toned bedrooms come decorated with hints of bright colours and patterns. On the ground floor, you will discover the sizeable master bedroom which is completed by a king-size bed, walk-in closet and en-suite bathroom. There is another bedroom on this floor which contains two twin beds. 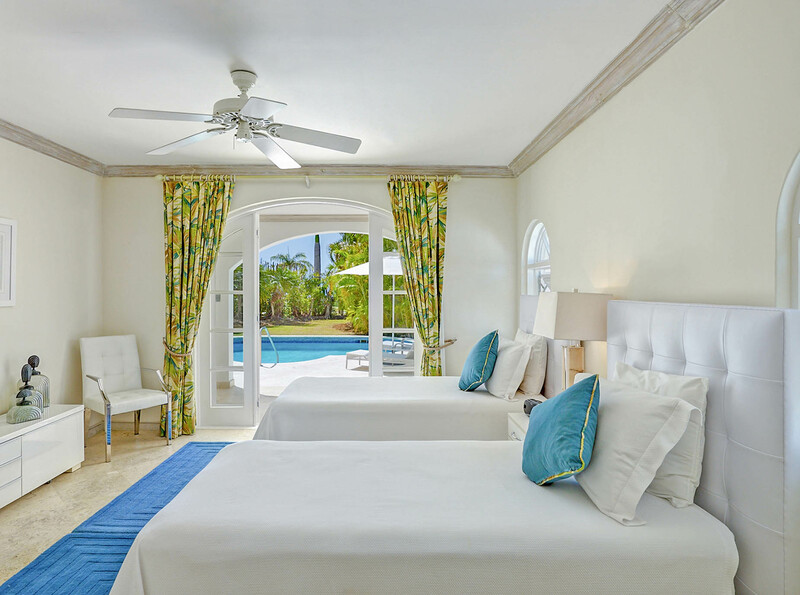 Both rooms provide easy access to the pool deck, where you can soak up the Bajan sun rays. 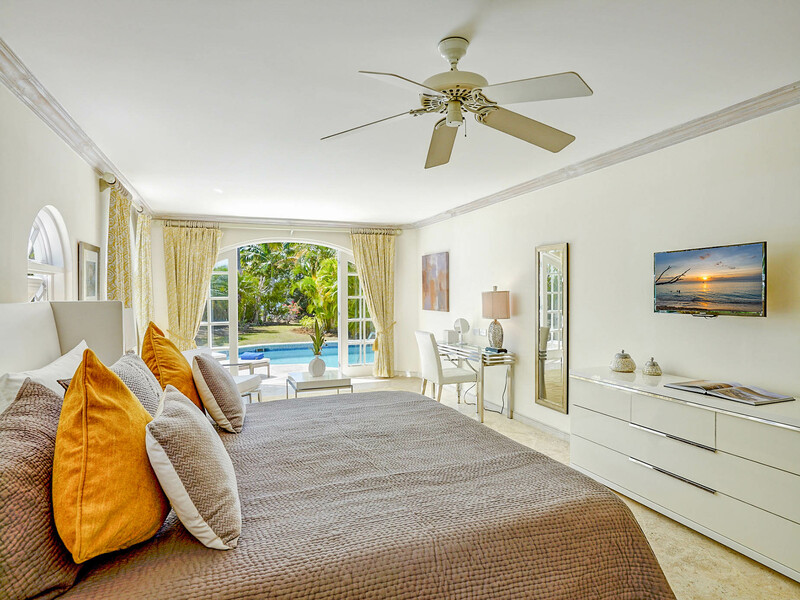 The remaining bedroom is situated on the first floor and is equipped with a queen-size bed as well as captivating views of the garden, pool, beach and sea. 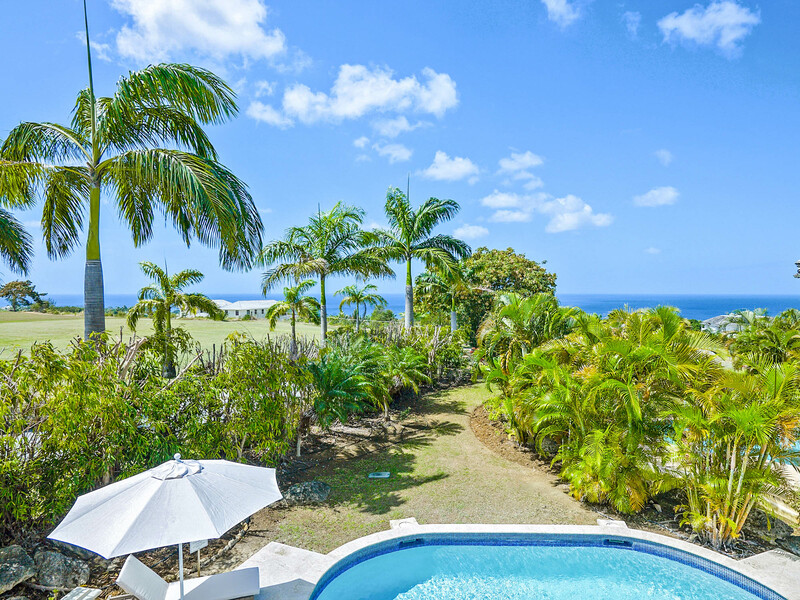 The holiday villa is located in the Parish of Saint James. 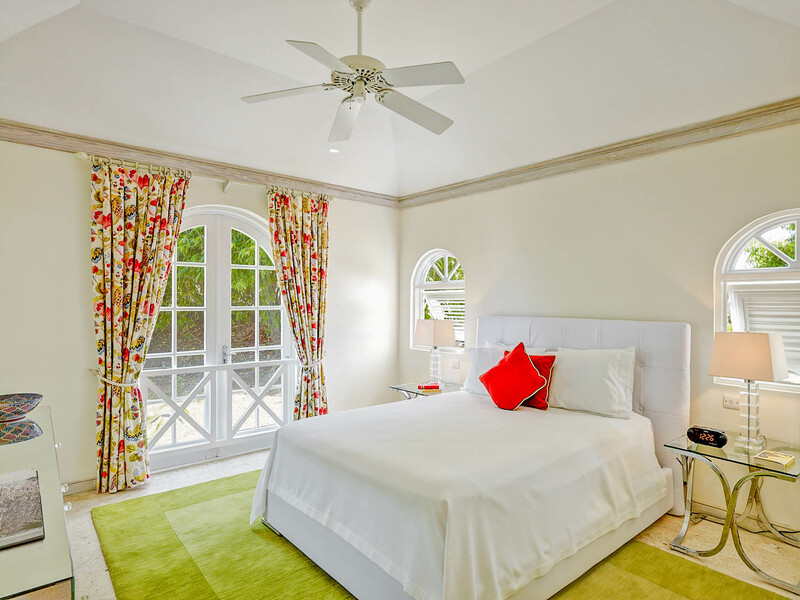 Coral Reef Hotel is nearby and possesses a colonial and classic Caribbean style. Guests will be able to indulge in the hotel’s spa services which include facials, massages and yoga. You can also dine in the on-site restaurant which overlooks the sea. The restaurant serves fresh seafood and traditional Caribbean dishes, and hosts live entertainment including limbo dancing, folk dancing and fire eating, every evening in the winter and five evenings per week throughout the summer. Sand Piper Restaurant provides another great dining choice. You’ll be captivated by the surrounding tropical gardens and ponds, and the tables lit by spotlights from the ceiling. The restaurant fuses European and Asian cuisine to create dishes served on the deck with waves calmly crashing in the background. The mouth-watering menu incorporates poached lobster, linguini and chicken liver as starters and lemon garlic tuna and pan-roasted salmon for mains, that’s just naming a few. They also possess an extensive drink and cocktail list. Only a 20-minute drive from the villa lies artist Rafza Nehaul’s working studio and art gallery on the island’s capital, Bridgetown. Using natural materials, Rafza creates unique and vibrant works that are occasionally three-dimensional - a must-see example of local Bajan talent and artistry!